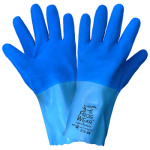 Chemical Handling Gloves are available in Rubber and Nitrile. 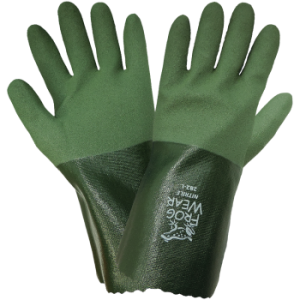 These gloves are ideal for handling a variety of chemicals for safety and protection. Our acid resistant rubber chemical gloves feature an Actifresh treated interlock knit cotton liner to reduce bacteria and helps absorb perspiration. Our Nitrile chemical gloves feature outstanding wet/oil grip and comfortable seam free poly/cotton liner.